Johnny Law's men beat the Cup holders in last week's semi-final at Dixon Park thanks to Karl Steele's goal. But a complaint was lodged by the students about the eligibility of one of the Ports players. On Thursday night that appeal was upheld by the Irish FA's Intermediate Cup Committee. Queen's will now play Crumlin Star in the final on Thursday 9th May. 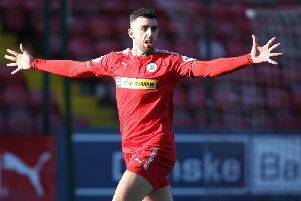 A statement from the Irish FA said: "The Irish FA’s Intermediate Cup Committee met last night to consider a protest lodged by Queen’s University Football Club regarding the eligibility of a Portstewart player who played against Queen’s in the semi-finals of this season’s competition. "The committee concluded that the protest by Queen’s University should be upheld and Portstewart were dismissed from the competition. "Queen’s University have been reinstated in the competition and will now contest the final against Crumlin Star on Thursday 9 May."